Anyone remember the Senior League? Ya, me neither. 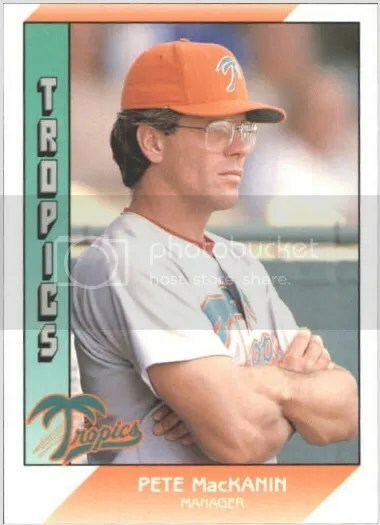 Apparently it was the brainchild of former minor league player Jim Morley. Morley was looking for a way to make some extra cash, and being inspired by the Senior PGA Tour decided to start a baseball league for retired players 35 years and older. I don’t know about you, but when I’m looking for some extra cash the last thing on my mind would be to start a professional baseball league. He got the ball rolling by sending out a few thousand letters to ex-players. It amazes me what individuals will invest in. In less than a year, Morley had the league setup. The Senior League attracted a bunch of well known players such as Fergie Jenkins, Rollie Fingers, and Bill Madlock. It shouldn’t surprise you that the Senior League folded after a season and a half. The league didn’t make enough money and was in a drastic downfall. Guys like Phillip Breen didn’t help much either. Breen was the President of Group One Mortgage, and got himself, the league, and other owners mixed up in a terrible financial scam. It just wasn’t good. 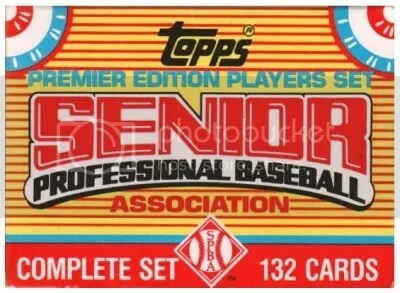 The 1989 Topps Premier Edition Senior League Baseball set consists of 132 cards. It was only made available in factory set form. Other manufacturers such as Pacific, Elite, and T/M made Senior League sets which can be found for very little money.